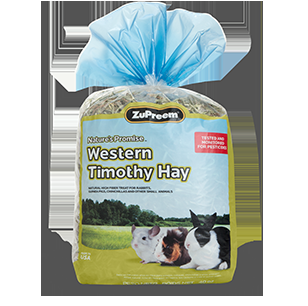 ZuPreem® Nature's Promise Western Timothy Hay is essential in the daily diets of growing and adult rabbits, guinea pigs, chinchillas, prairie dogs and other small animals. This low-protein, long-strand fiber hay is the most recommended hay for everyday feeding. Grown in the fertile valleys of Idaho, it is the most premium Timothy Hay grown in the United States.